Hi wizards around of the world ! As said in the last devlog about the 0.3 update of the GWT, let me talk today about the spellbook, which is the new page added in the last update. The main goal is to show every player the spell with a short video and with some explanation about his abilities. It can also be for the new players discovering the game and the spells, or the older ones to discover the new spell of the update for example. After a while, we will also add a button on this page to directly go to the practise to try the spell selected. 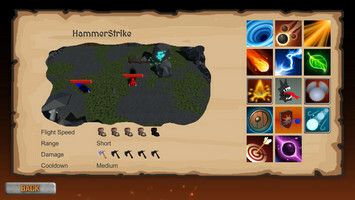 And later, when the connection module will be implemented, each player will be able to create spellset to be directly ready for the game (and avoid the part he has to choose spell in lobby). We started the spellbook as we imagined it, without too much thinking. So we launched the game to do videos for each spell. We only have 13 at this time, so it was not too long to do a video for each. And we were thinking that, making a video for each new spell was totally fine, little by little it wouldn't be too annoying. But at the same time, we were improving the models and the effect of each spell, so everything was changing, so we had to redo some videos. We finally finished. Proud of us, we created build of the game ready for players. Unfortunaltely the build got two times heavier because of the video, from a light game we started to become very heavy.. and this only for videos.. and only for 13 spells ! So we got at this moment that using real videos were totally impossible. The choice was made to simulate the video we did ourselfes with the real game engine. If this can be easy for other kind of game, The Great Wizards Tournament is a multiplayer game with authoritative server, that means that all the physics is decided by the server. One possibility would have been to recode all the engine on the client too, but it means that all next change on the engine later (add of spell for example) would need to be code two times.. So that's not the choice that was made, and we decided to launch locally the server for the spellbook, so the simulation is exact compared to what happens ingame. No recoding, just some changes to do once on server to be accept scenario for each spell. Thanks to this, the weight of the game, came back to a light one, no need anymore of heavy video, and spellbook shows the real graphism, effect and sound of the spell.